How do our Food Slabs hold up to stains? We Test! At American Stonecraft we’re dedicated to making the best products we can, so we set out to test just how well our Food Slabs hold up to stains by putting our stain-resistant finish on our Food Slabs through the ringer. 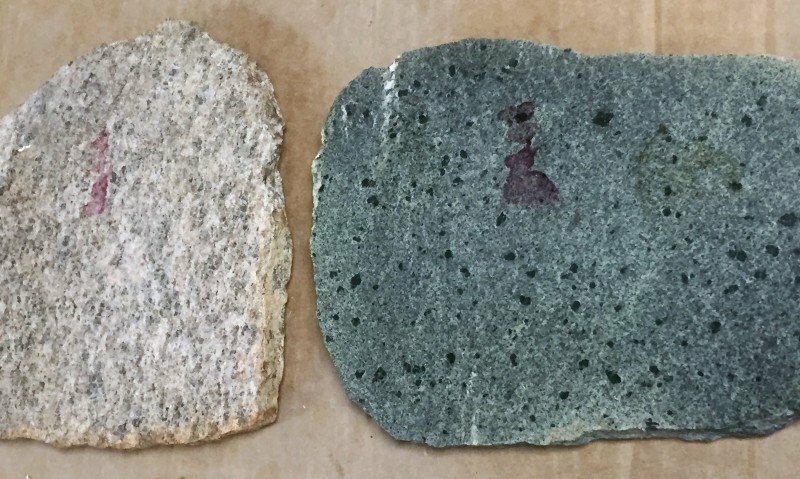 The FDA considers a stone as food safe if it is smooth and can be washed. For American Stonecraft, that is achieved by polishing: a process of grinding stones with diamond surfaces of varying coarseness. Eventually, the stone’s pores are closed, and the stone reflects light like a mirror, indicating the top is as smooth as a glass, for us, that is at about 10,000 grit. After the time-intensive process of polishing, the artisans then add a food safe product derived from fluoride that gets in to pores on a microscopic level and makes the entire stone even more resistant to staining. This product repels water, oil and grease. The water beading effect even causes liquids to bead up on the surface for easy cleaning because they cannot gain surface tension. Liquids will fall off a Food Slab tipped sideways. 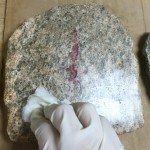 This process does not visibly change the stone in any way. 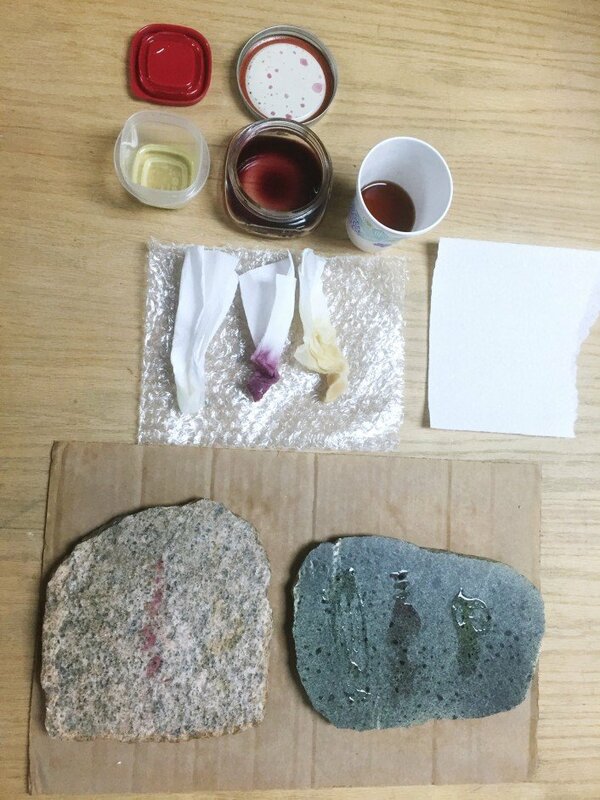 To test the stain resistance, we selected three liquids that commonly cause stains in the kitchen: hot coffee, cool red wine, and cooking oil. They were spread in even strips across two different stones: a softer, naturally porous light-colored stone and a harder dark-colored stone. One thing that’s immediately noticeable is the beading effect causing the liquids to stay in neat lines. We then cleaned the slabs with tap water and a mild dish soap. 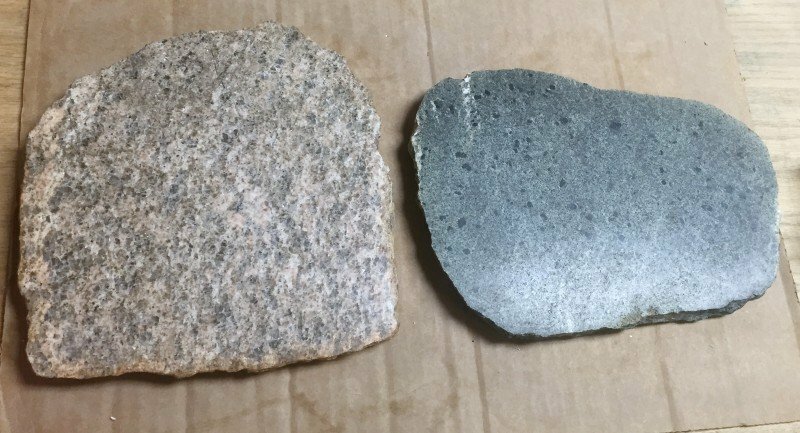 At the end of the testing both stones were wiped down with our Triple Effect product that we offer in our online shop. This is a food-safe cleaner, sealer, and protector designed to help extend the stain resistance of the stone. The Food Slabs were cleaned in stages, from bottom to top, after 2, 6, and 24 hours with water and dish soap. The coffee, wine and oil all washed off completely. Both stones cleaned up easily at first, but we did notice after 24 hours we really needed to scrub and add a little elbow grease! – Every stone is different and porous, softer stones may stain more quickly. We recommend cleaning your Food Slab directly after use. Do not use steel wool or scouring pads, as this may scratch the finish. – We want our coasters and trivets to be absorbent, so they DO NOT have the stain-resistant finish. We do not recommend eating directly off of them if you are concerned about staining the stone. This entry was posted in Products and tagged food slab, product test, testing.